Wow.. It’s October already? October always reminds me of Hairy Crab. 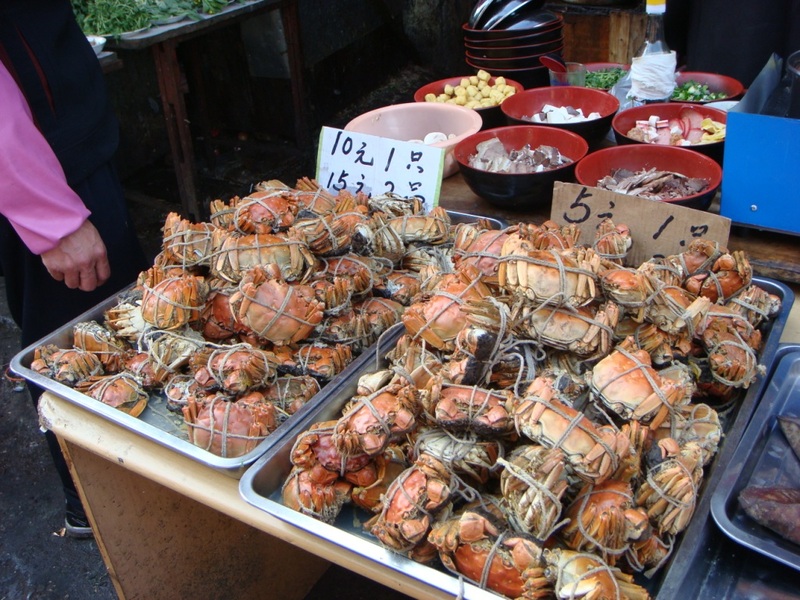 Now is the year again where you will see plentiful hairy crab being sold everywhere if you are in Shanghai. 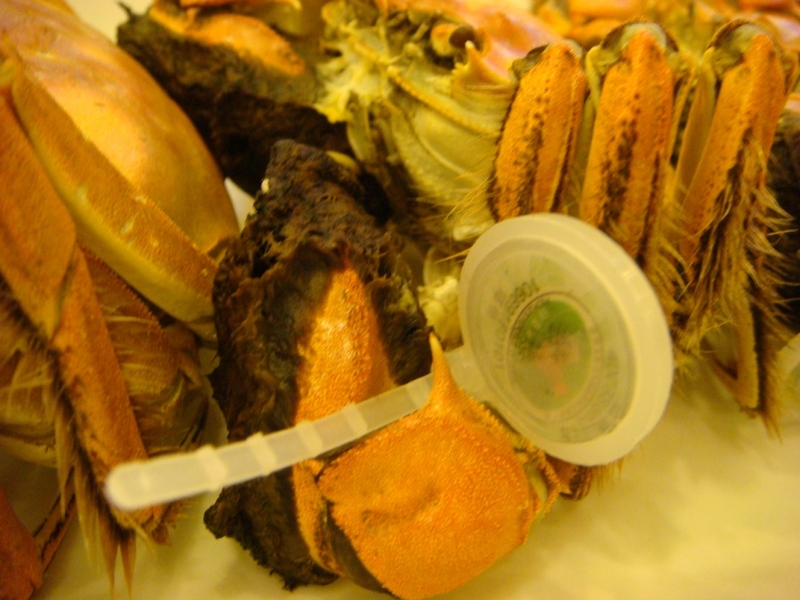 Hairy Crab is better known as the “dai-chap-hai” within the Chinese community. If you check on wiki, they call it the Chinese mitten crab (due to it’s furry claw). Most people love the female crab because of the roe. There’s many way to prepare this delicacy. For me, the best is still simply steam them and eat them with some vinegarish ginger sauce. You can easily buy the pre-cooked crab in the market. 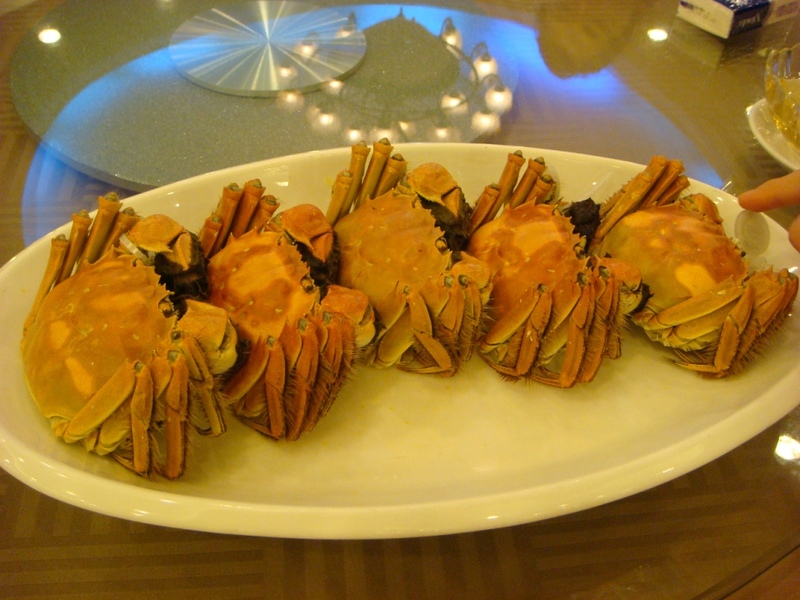 The female cost about 10 yuan / crab and the male about 5 yuan / crab. Now, how do you tell if it’s a female / male? I recall that it is from the pattern on the tummy of the crab. the centre of the crab got a piece of shell. The bigger center is a female and smaller is male.. Or was it vice versa? hmm… don’t remember. Will need to double check on that again. 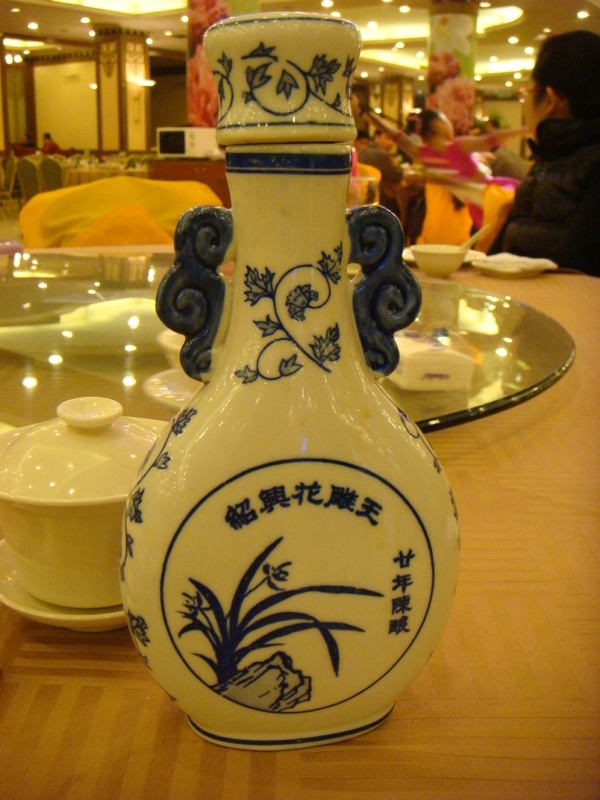 As for me, my cousin-in-law is from Shanghai. So, I was fortunate enough to be invited for some home-cooked style. hehehee… On top of the hairy crab, we had tons of other typical shanghai cuisine. Look at that !! piping hot. ohh… it was so delicious ! 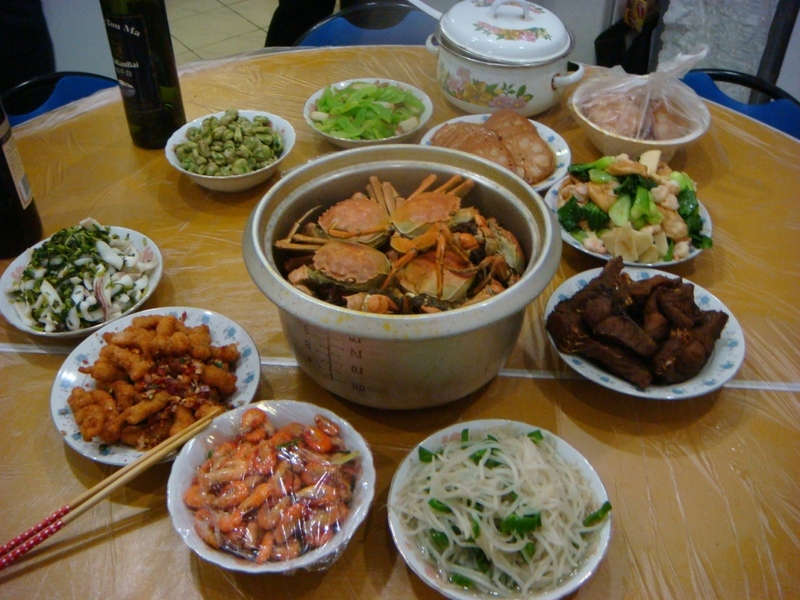 I had 2 dinner over at my cousin’s family place and both time, they serve us hairycrab. And was I sick of them? NOOOOoo… I just couldn’t get enough of them. hehehe. On top of the home-cook ones, an old family friend who had settle down in Shanghai invited us to dinner in a really nice restaurant. Since it is the hairy crab season, Ms. A insisted we had them. Yay !!! who am I to complaint. She told me that in this restaurant, we can have the hairy crab that is caught from the actual origin place (Yangtze River) and it is suppose to be far more superior compared to the breed type. 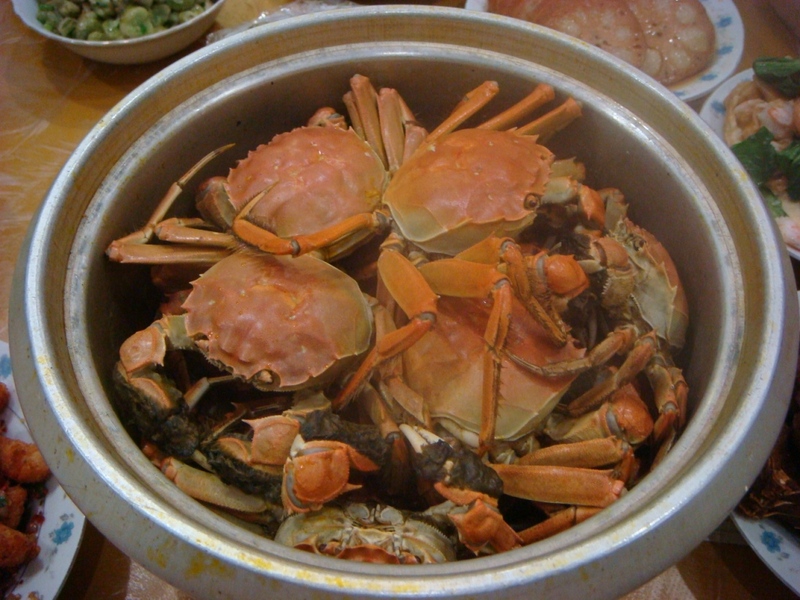 Because there is a limited quantity of these crabs from this river, each crab caught here are tagges and registered !! Most of these are exported to countries like Hong Kong, Macau, Singapore and etc.